Philips Avance Turbostar AirFryer is no doubt the best Airfryer. It is a much better version of the Philips Viva and has many more advanced features than the Viva Airfryer. The Turbostar Airfryer is an amazing device which can cook almost anything inside it, so if you are looking for the most advanced Airfryer or if you want to get a hold on one of the best airfryers then this review is something you have check out. Without any further ado let’s start decoding the Philips Turbostar. 1. Apart from all the general pros of the Airfryer, a feature that sets apart this Airfryer is that it cooks evenly on both sides and you do not need to flip the food halfway through cooking which is the case with every other Airfryer available in the market. 2. The Airfryer is huge and can cook for 3-4 people, however for a few dishes like the grilled cheese sandwich and other dishes, it can probably take some time for you to make it in batches but if you plan on making chicken wings or french fries, then you can easily make these for a group of people. 3. The food cooks beautifully in this Airfryer and you would soon see more of it under the cooking results heading. The food comes out with a beautiful color and looks evenly cooked from both the sides. The Airfryer gets heated up really fast and it can cook most of the snacks within 5-10 minutes where any other Aifryer would have taken longer. 4. The basket is nonstick and comes with an internal locking system which keeps the basket firmly locked in while the food is being fried. Using this Airfryer is pretty easy and you can easily clean the basket as it has a non-stick film coating which makes it really easy to clean and reuse again. 5. The timer on the AirFryer can vary from 0-60 minutes and once the timer goes off, the Airfryer automatically stops cooking. The handle which is used to pull out the separator is insulated pretty well, hence you can pull out food items immediately after they have been cooked inside the Airfryer. The food can stay hot for up to 30 minutes inside the Airfryer so if you want to take and break and then continue eating you can do so. 6. Since the Air Fryer does get hot inside really fast which implies that you barely need to preheat it before cooking anything(although you might want to do it for a few dishes). There are vents in the AirFryer that help maintain balance in temperature and make sure that it does not get way too hot. 7. The Airfryer barely produces any sound while it is ON. It sounds similar to an oven and in the case, you are wondering, yes, the other Airfryers at a lower price point produce an unpleasant noise while frying. This Airfryer is way better when it comes to having a quiet cooking experience. 8. It can cook almost any dish perfectly and you can even bake a cake inside this Airfryer. This is barely possible in most of the Airfryers as the cake is never baked to perfection but the Philips Turbostar Airfryer does it again by baking the cake to perfection and giving us the perfect results. 9. 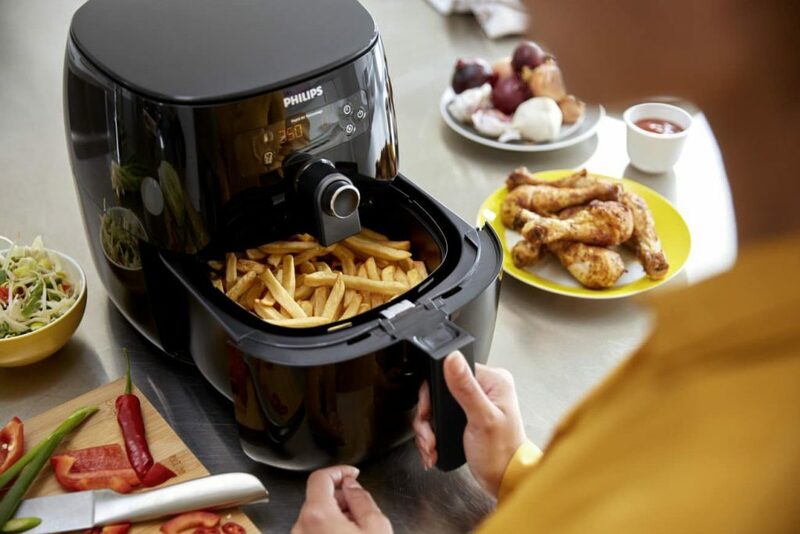 The fries and wings taste the best in this AIrfryer and it does not give you the feeling of being cooked in minimum oil. Most of the other Airfryers can cook the food really dry but this Airfryer here is perfect and the food gets cooked in the same way as it would have if you deep fried it. Although the taste may not be 100 percent same, you will definitely not feel the difference until someone tells you it is been cooked in the Airfryer. 10. The Airfryer comes with a 2-year manufacturer’s warranty. 1. If you have a family gathering of more than 4 people you might have to cook in batches which can be a bit tedious. The chicken nuggets cooked perfectly well in this Airfryer. Although they can get a bit dry so you might want to add one tbsp of oil so that they retain a bit moisture. Another way is to reduce the time, so setting the nuggets to 375 degrees at 15 minutes should do the trick. However, the nuggets cooked really well from both the sides and were evenly cooked which is definitely a win. Something that I did not expect an Airfryer to be good at was baking a cake with perfection. The Cake that was baked inside this Airfryer is definitely one of the best. Follow the recipe for the cake as shown in the video below since the cake batter needed for an Airfryer is slightly different than the ones you find for the traditional cakes. 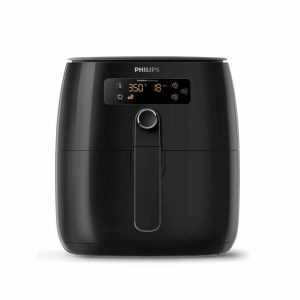 The Airfryer is amazing and if you want a multipurpose device that can cook almost anything with little to no oil consumption then the Philips Tubrostar Airfryer should be your first preference. 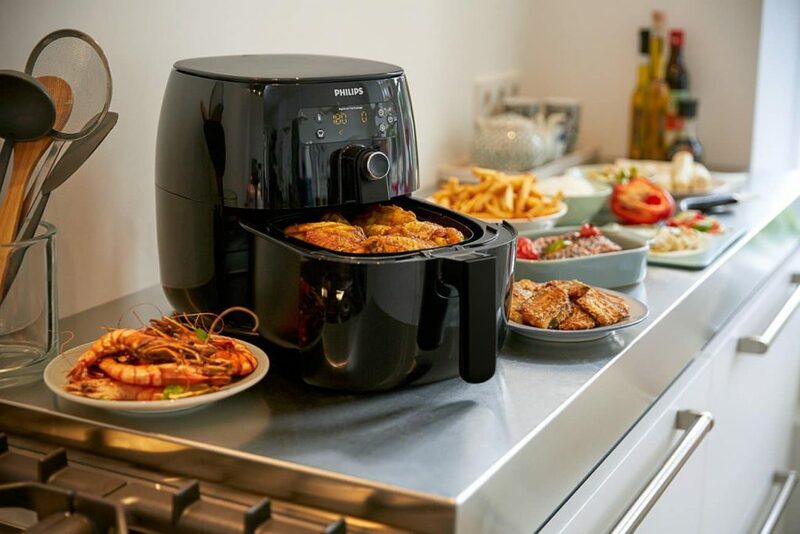 It is definitely the best Airfryer and since the holiday season is close, it is perfect to gift it to someone who loves eating fried food items. This Airfryer is one of the best ways to practice healthy eating as it consumes very little oil and fries food perfectly well. If you are on a diet and still want to enjoy french fries sometimes then this Airfryer is a steal and even though it might have a higher price point you are definitely going to use it for a really long time. The Airfryer comes with a 2-year warranty from the manufacturer so in the case you have any manufacturing defects, you can get a replacement. However, the warranty varies for different situations so do your proper research before making the purchase. If you have this Airfryer then do let us know about your experience in the comments section below! Do you know anyone who loves fried food but avoids it since they are on a diet? Share this post with them and let them know that they can now enjoy all their fried foods without too much oil consumption.